In 1922, Alice and her private detective boss leave their Chicago office to consult on a bootlegger’s death in Long Beach, California. Discovering that Robbie’s murder is linked to two others, Alice and Joe meet with a housekeeper having a litany of opinions and stories, an unforgettable handyman, a rich man’s mad wife, and the Admiral who lives under Signal Hill. In the haunting shadow of battlefield trenches and prehistoric whale bones, this mystery novella tells of WWI survivors, their friends, and the demons battling for their souls. The story is told by twenty-six-year-old, Alice Glenn, secretary to private detective Joe Finnegan. I enjoyed spending time with these characters and the case that brought them from Chicago to California. I hope you do too! 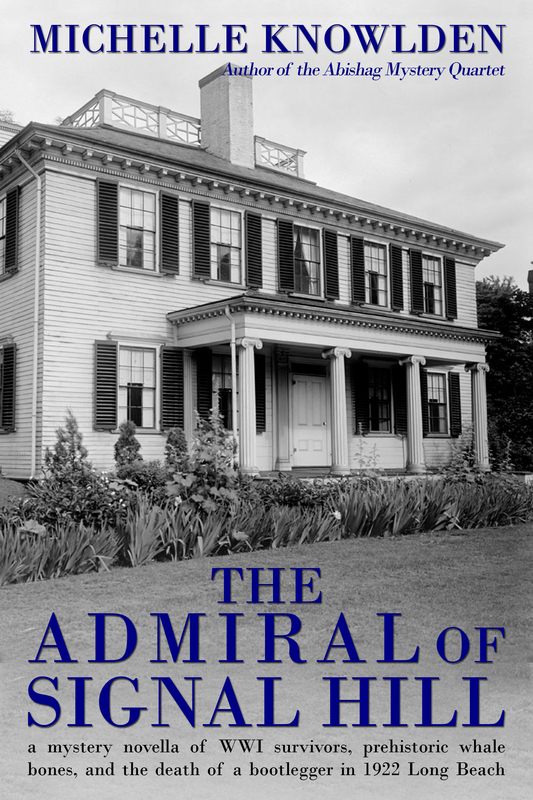 As I’ve mentioned with other books, if you do like THE ADMIRAL OF SIGNAL HILL, please consider writing a review on Amazon and GoodReads. You can do nothing better to support an author and her books. Again I’m grateful to my critique group, OC Fictionaires: they had an impact on this book. Bethany Barnette came up with another superb cover. I truly appreciate my hard working beta readers: Kris Klopfenstein and Rebecca Lang. Thank you all for your encouragement and support. I dedicated THE ADMIRAL OF SIGNAL HILL to my family and to all those who have served in the military, past and present. I hope you’ve told someone recently who stands in harm’s way that you appreciate their service. Giving them this book might be a nice way to thank them too! This entry was posted in WRITING and tagged 1922, Bethany Barnette, Bixby Knolls, bones, bootlegger, bootleggers, Chicago, doughboys, fossils, Long Beach, Memorial Day, mysteries, mystery, novella, Prohibition, shell shock, shellshock, Signal Hill, THE ADMIRAL OF SIGNAL HILL, WWI. Bookmark the permalink. I was glad to read it. I like your dedication to the military; that was sweet. Wish you lots of success in your endeavors. I include your brother, of course. Thank you, Rebecca. Michelle, something very different from you! Looking forward! Thank you, Kaye! It was a bit stretching.